Since the beginning with Knights of The Old Republic, a player had their choices to make. These choices not only impacted the story, but had an effect on the morality of the character…were they light side or were they dark side. However, there is another path one might tread between light and dark that is the neutral or gray. This week’s guild has a backstory along these lines, but that is not all there is to this guild. They are a “close-knit” group that has seen ups and down but keep moving forward. Although some of the guild’s playstyle has changed and adapted as membership has changed, they are certain about enjoying SWTOR and hopefully having capital ships for guilds! How did the guild get started? The Gray Order was started around May 2011, with the goal of providing a guild that welcomed a broad range of players and interests. Initially the guild was not expected to become very large, more a closer-knit group of people, but it has since undergone ups and downs in membership before stabilizing. Though many of our members have played other MMOs prior to SWTOR, it was not the primary unifying factor that influenced the guild’s formation. How did the guild decide on the type of server? The consensus at the time was that a PVE server would be best. 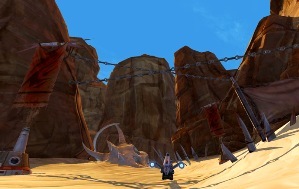 A number of the founding members had unpleasant issues with griefers in the other MMOs they played in who interfered during leveling and other questing activities. Given that BioWare gave us the ability to flag for PVP whenever we wished, going on a PVE server maximized the choice guild members had. Those who wanted to could flag and PVP, and the rest could choose not to and play in peace. In the guild’s backstory you have a home planet, how did this come about? We voted on it actually, with the final choice being Taris, Alderaan a close second. Prior to the game’s launch, not everyone had the chance to actually see what each planet was like in-game. 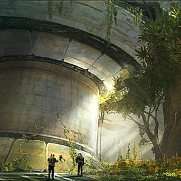 Taris fit lore-wise, as it was a backwater planet undergoing a slow reconstruction, an easy location for the guild headquarters to go unnoticed. Given our motto as doing the right thing for the good of the galaxy, even when the Republic or the Jedi are slow to act, having a less evident home base made sense. With a backstory that your guild has how big is RP to the guild? Not nearly, as big as one might imagine. The guild has a backstory, and many of our members have created similar stories for their mains and alts, but by and large, it does not factor in to our playstyle or the activities we participate in. RP is more on the individual level rather than a guild-wide activity. Would you like to see BioWare setup guild bases/capital ship instances? Definitely we would. While not a requirement for a guild to function, a unique base or capital ship, ideally with some way for the guild to customize them, provides a strong sense of identity beyond simply gathering on the main fleet. Does SWTOR help promote an environment for RP? Does this need improvement? Not particularly unfortunately. The environment may be different on a RP server, but there are no genuine tools or incentives to act RPishly while playing and little enforcement if any violations occur. It is up to the community as a whole to provide that environment, and outside of a RP server, that may not happen on a large-scale. Our guild is more or less indifferent; improvements to encourage RP certainly would not hurt, but it is far from a priority. Did The Gray Order have to go through transfers? If so, how was the experience personally and as GM? Yes, our guild was originally placed on the Sith Meditation Sphere before we got transferred to The Shadowlands. For the vast majority of our members, the transfer process was remarkably simple and quick. As GM, it was more involved unfortunately. BioWare provided no tools for GMs to notify less active members of the impending transfer via an in-game guild-wide message system, so getting the word out took some effort. Also, the requirement to disband the original guild before the GM could move their own character and have the guild bank restored on the new server was somewhat frustrating. Personally, the guild disband feature would not work properly for me, so CS had to work that out. I give props to them for a fairly quick reply and very courteous service. On the whole, the transfer could have been quite a bit more hectic, so there aren’t real grounds for complaint. The guild’s first rule for gaming is to have fun. 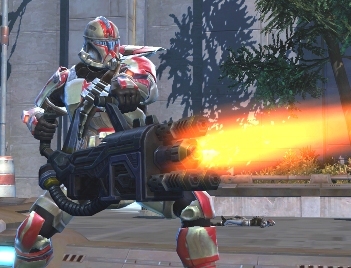 What ways has the guild achieved fun in SWTOR? Fun is definitely subjective based on the individual. Our guild tries to offers a solid spread of both PVE and PVP content. Operations of every level are run every week to allow as many people to participate as possible. Groups for dailies, leveling alts, PVP both regular and ranked warzones, also occur on a regular basis. On our old server, there was some attempt to get some world PVP going on Ilum or Outlaw’s Den occasionally, but due to faction imbalance and our server losing players, it did not occur as frequently as hoped. Does the guild plan events? What sort of events and do they help promote fun for the guild? Not really, we have scheduled nights where certain events are happening, mainly for operations, but everything else generally is organized on the fly. Most of our regular members join up in TeamSpeak and much of what we do revolves around whoever is on at the time. As for the types of events, the answer to the previous question sums it up nicely. Did the guild take part in the Rakghoul Plague event? Would the guild like to see more events like this happen in SWTOR? What kinds of events would the guild like to see? We did, though it was more on an individual level. For killing the event-specific world bosses, such as one in Outlaw’s Den, we definitely grouped up as a guild to participate, and actually had some really fun world PVP go on for quite some time. Pretty much any event that adds variety to SWTOR would be appreciated. Though it probably would not happen for some time, a space-based event, preferably involving guild capital ships, would be awesome! Does the guild plan on having a Sith guild for Legacy benefits? 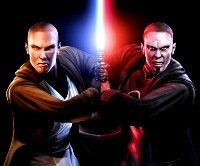 Is it good or bad for SWTOR to encourage players to play both sides? We actually did have a Sith guild on our old server, but it never really took off. Not all of us created or played Imperial alts regularly, and those who did sometimes joined other guilds on that side. Upon server transfer, the Sith guild was not reformed, though in the future when more players start wandering to the Imperial side, we will probably remake it. 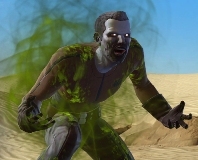 For Legacy and story purposes, it is a plus for SWTOR to encourage players to play both sides. Beyond ensuring everyone gets to experience every aspect of SWTOR, it also unifies the server community instead of dividing it into faction-specific sections. Is The Gray Order recruiting? If so, are there specific classes or roles the guild needs? Yes, we recruit for both PVE and PVP. Unsurprisingly, tanks and healers tend to be in short supply, and we generally have too many melee DPS compared to range DPS. We certainly would not turn away interested people that do not fit these criteria, but it will preclude you from participating as actively every week in our scheduled events due to class balance issues. What is the best way for potential recruits or folks to find out more about the guild? Are there specific members they should contact in-game? The best way to find out more about The Grey Order is to speak to our officers or get in a group with our members in-game. Grtamericanhero and Mugya tend to handle recruitment for PVE, and Fahrenheit, Bronopoly, and Killothian handle recruitment for PVP. We are active at most hours of the day, except for late night and early morning hours. That’s it for another Guild Checkpoint. We want to thank to all the members of The Gray Order for letting us learn about their guild. I want to thank a few members for their assistance in relaying messages in-game and via the web. I also want to thank their GM, Alverna for his time during the past holiday week. If anyone on the Shadowlands server is looking for a Republic guild to join, I would get in touch with some of the members of The Gray Order.